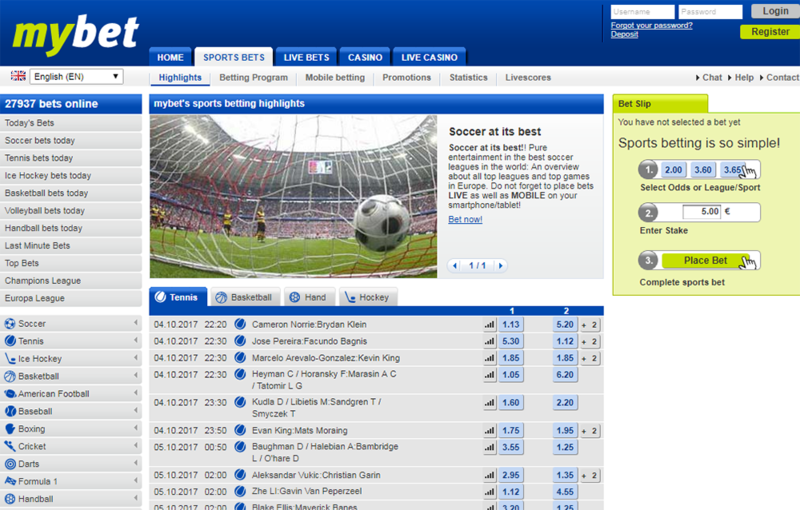 With up to 14,000 sports bets and live bets online and thousands of sporting events during the week, mybet is one of the largest service providers online. Our vast selection covers soccer, tennis, ice hockey, basketball. For the biggest sporting events, you can even bet live up to the last minute. We offer the best odds in the market on every league. Our quality casino has built a one-of-a-kind variety and reliability. PEI Ltd. is a 100% subsidiary of the German publicly listed mybet Holding SE. PEI Ltd. is headquartered in Malta, and holds a European license in sports betting and casino. PEI Ltd. has been successful in the market since 2002. We guarantee your transactions and deposits are protected in measure to the highest European even German technology security requirements. Your data traffic is fast and permanently protected. None of your data will be given to third parties. Your data is completely safe with mybet. We proudly invite you to “try us”. Set up your mybet account and deposit to start your betting fun. We offer our new users a large sum to go on top—so that testing is easy and carefree. And when you want to withdraw your money or winnings, we work as quickly as possible because we know that trust is the most important for satisfied customers. With over 14,000 online sports bets, hardly any other provide in the world matches up to our large range of game varieties and betting types. Our live betting offers pure excitement and instant results. All bets are offered with notably user-friendly high odds and with the right stake can provide especially high profits. Your betting experience is boosted through attractive bonus offers and a sophisticated VIP program. Also with free extensive background information for every event, team and athlete, you have the chance to review your betting tips. You can even check live and past game results and performances.